Taken at Mclean Little League game in McLean, VA on October 2, 2013. Top Left is Jamie Crittenberger. Bottom left is his son Kelly Crittenberger age 10. Top Right is Cabell Fooshe. Bottom right is his son Cab Fooshe age 10. Note Kelly Crittenberger had made it on base 21 at bats in a row coming into this game! 1) I attended the 1st Cav Div annual reunion in Ft Hood from 6-9 June and visited the Cav museum. They had a rather large display on Father Emil Kapaun and his award of the CMH, which I'm sure you, Mike in particular, would have appreciated. 2) I was able to purchase a copy of Will Lathham's book, "Cold Days in Hell - American POWs in Korea" from the local Barnes & Noble. Haven't read it yet, but I'm looking forward to doing so! 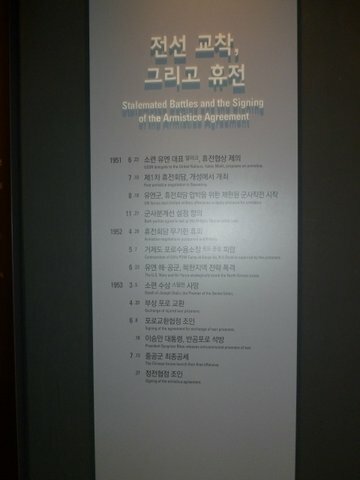 3) I was among those who visited Korea 21-28 June to help celebrate the 60th reunion of the Korean Armistice Agreement. Reps, to include young people, were invited from all the 22 nations that fought alongside the ROKS during the war. LTG Rowny (Ret) was the senior US rep - he's 96, blind, and wheel chair bound, but he has a remarkable memory that permits recalling every conversation he ever had with anyone! (He is Cl of '41 and was on Gen MacArthur's staff and helped plan the Inchon invasion - has a book coming out this summer: "Smokey Joe & The General"). I sat next to him on the 14-hr plane ride back - and he is remarkable - and he plays the harmonica like a pro! The Korean Gov displayed a special effort to show their appreciation for all nation's support during the war and making it possible for their being such an advance industrialized and democratic nation today. President Park did have a reception for us, the day before she left for her meeting with the Chinese Government! We all came away so impressed with what the Koreans have achieved, thinking the sacrifices we made may have made that "Forgotten War" worth the costs after all - a message every soldier and US citizen should hear! 4) I did visit the Cl of '50 memorial placed on the grounds of the Korean Military Academy(KMA) in '92 - really stirring to see the names of all our classmates who were KIA/WIA in the war inscribed on the monument. I do have pictures which I will send to Sandy. A point - the Koreans send a candidate to West Point every other year; West Point has never reciprocated! The Lt escorting me around the Academy was a KMA graduate who received his Master's at Columbia Univ (NYC) and was an Rhodes Scholar! Their program is a model for all Academies! OH! It took me 6 hrs to travel BY CAR from Volney and Janice's house in McLean to our home in Williamsburg!